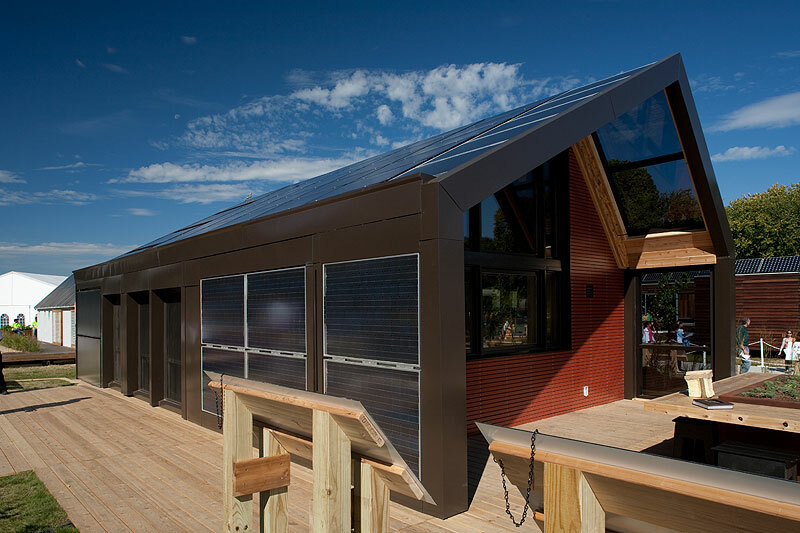 The University of Minnesota's ICON Solar House was on display at the Bell Museum of Natural History in Minneapolis. After the U.S. Department of Energy Solar Decathlon 2009, the University of Minnesota stored ICON Solar House on campus until summer 2010. The house was then reconstructed at the university's Bell Museum of Natural History for an exhibit titled "Sustainable Shelter: Dwelling Within the Forces of Nature." The exhibit—which ran Oct. 16, 2010, through May 15, 2011—considered the changes in residential development and consumption patterns over the past 150 years. In March 2011, the university issued a request for proposals "to see the house reused for residential or demonstration purposes," but it was unable to find a buyer. Instead, it installed the house at its Cedar Creek Ecosystem Science Reserve, where it is used as an office and faculty housing. ICON Solar House continues to live up to its lofty name. In addition to placing fifth overall and first in the engineering contest at Solar Decathlon 2009, ICON Solar House was selected as one of the 2009 projects of the year by Finance and Commerce.